Klipfolio’s product team has been using a performance management system based on objectives and key results (OKRs) to set objectives for our agile teams since the beginning of 2018. Even after such a short period of time, we’ve seen so much value in the process that the rest of the business has decided to adopt the OKR system. In this post, we will discuss what we’ve learned about the OKR approach, explore the value we’ve found in it, and offer tips for setting up an OKR system so that you can get the most out of it. What are OKRs (Objectives and Key Results)? The OKR system is a performance tool that sets, communicates, and monitors goals in an organization so that all employees work together in one direction. The beauty of the system is that it provides a simple, practical, and straightforward framework for defining, tracking, and measuring goals, both as something to aspire to and as something that can be measured. Having ambitious objectives can motivate the team to push the envelope. And measuring the key results determines whether the goals have been reached. Why is the OKR system useful? Alignment - It helps with alignment, so that all team members are pulling in the same direction and contributing to what matters most in terms of results. Engagement - It gives the teams a sense of purpose to know they are working towards defined goals and therefore increases engagement. Focus - It helps focus efforts so that people work on things that matter. Performance - It stimulates employees to go above and beyond, and they often perform better than expected. Autonomy - It helps teams work autonomously, secure in the knowledge that they are contributing to overall goals. Of those five advantages, the most important for us is alignment, which is one of the biggest challenges that teams run into as they grow. OKRs permit alignment while allowing teams to retain their autonomy. We set objectives and key results as part of our planning process. Different levels of the company set different objectives and measure different key results. For the company as a whole, we have a long-term planning document put together by the senior management team that sets out objectives and measurable key results over the next three years. We also have a set of company-wide OKRs for each quarter that define our next steps towards the longer-term goals. On a quarterly basis, the product team sets high-level product OKRs. These are determined by the product leadership team to reflect how each team is going to reach the business OKRs. Finally, each agile team comes up with its quarterly OKRs. These indicate how they will be contributing to the high-level product team OKRs. The hierarchical relationship and the interdependence between various levels of objectives and key results help clearly define each team’s purpose and link it to the long-term objectives of the business. We think this is a very powerful managerial tool for creating unparalleled clarity across the organization. A couple of weeks before the beginning of each quarter, the product leadership team puts together the high-level product OKRs. Then, teams work on their OKRs, which are informed by the high-level ones. Finally, the leadership team and all scrum teams get together and review the team OKRs. This helps the teams improve their OKRs based on the feedback they receive and identify whether any one team depends on the actions of another to achieve its goals and related deliverables. We’ve been going through this cycle every quarter since the beginning of the year. The quality of the process and the OKRs have been improving every quarter and we’ve been learning along the way. We’ve also increased the autonomy of the teams as we have gone along. The first time we went through the process, each team had pretty much a pre-defined backlog of goals, and to some extent we had to reverse engineer the OKRs from the backlog of objectives. This actually defeats the purpose of OKRs, which is giving teams goals and letting the smart people come up with the answers. 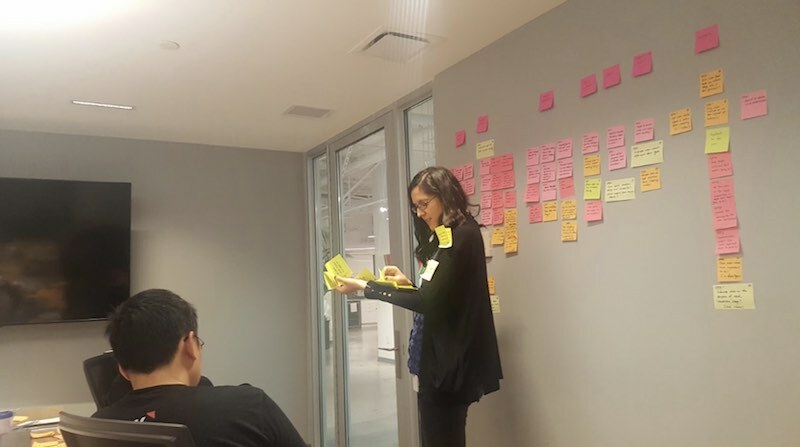 In the most recent cycle, the teams came up with their OKRs through brainstorming sessions and their understanding of how they can move the needle and contribute to the higher-level objectives. As a team, we have the habit of continuously improving ourselves, and the OKR process is not an exception. Therefore, we recently conducted a retrospective with all the team leads. OKRs have focused the team efforts and made priorities clear. They have helped clarify the direction the team is working in - both what to work on and what to not work on. They have made sprint planning easy; if work items don’t contribute to our OKRs, we know we can de-prioritize. They help keep our main objectives on track. They help align objectives among team members. Because teams are involved in the process of defining OKRs, there is better alignment between teams as well as ownership of the goals that have been set. Having OKRs clarifies what we work on for other teams, making it easier to explain why we can’t work on their asks. OKRs highlight the where groups depend on each other. Having OKRs make communication with the executive team easier. Having a quantitative and metrics-based approach helps keep us on track. The ongoing checkpoints create accountability. With clear goals, it’s easy to know when we are diverging from the plan. The OKR system has fostered additional research and a better product development process. It also helps with thinking about cause and effect (A -> B -> C). Having OKRs helps teams stretch more. It is now clear how what we work on affects business objectives. It has helped us achieve what we assumed was impossible. It has also resulted in more autonomy and flexibility in achieving objectives. Teams with more autonomy also came up with creative ways to achieve their objectives. There was one other specific positive outcome of the process: We used our own product to monitor our OKRs. We put together a Klip for each team and a dashboard that showed where teams were with their OKRs at any given time. The process of setting goals and working towards measurable key results was not without pitfalls, though. Planning for three months can be difficult. At worst, it undermines agility. Sometimes the reality changes and the key results we had originally decided on don’t fit anymore. Interruptions or changes in the timeframe can prevent success. Missing key results can feel like a failure even if the reason for missing them is outside the team’s control. Some objectives were too abstract and difficult to define. Some were not measurable during the quarter. Some key results were high-level products, which can be hard to use as guidelines. Using confidence levels for measuring key results is not ideal. These can be subjective and hard to measure. Binary key results (yes/no) don’t encourage quantitative measurement. There is a sweet spot between too many and not enough; we’re still working on that. But we have learned that having too many key results can reduce focus. We have also learned that there needs to be a clear distinction between results we can aspire to and results we are committed to achieving. We found we need to make sure teams don’t turn into silos with their OKRs. To be effective, the OKR process has to start and finish on time. The best practices - What should we keep doing? Don’t make backlog items or implementation details part of the OKRs. Go one level higher and focus on the business outcome and what needs to be measured. For example “Increase user engagement” will work as an objective, in part because it is measurable and does not prescribe a solution; “Implement user-centric sharing” is not ideal since it’s very prescriptive. Invest more time, in the beginning, to come up with better OKRs. Design OKRs to foster autonomy. Get input and stakeholder alignment. Involve the team members and make sure the process is not top-down. Avoid having too many OKRs. Less is more. In our experience, there should be no more than three objectives and three to five key results per objective to work towards. Tie the OKRs for each product team to company-level OKRs. This helps clarify why they are being worked on. Make each OKR measurable and easy to track, and update the numbers often. We reference the key results in our issue tracker to make traceability easier. Actively use OKRs in the sprint pre-planning and planning sessions to facilitate the prioritization discussions. It becomes easy in this context to say that if a feature does not contribute to the OKRs, it can be dropped. Review the OKRs with the team regularly and continuously reinforce the objectives. Dropping or adjusting certain key results is acceptable when the reality changes. There is no need to keep measuring something that you know is not going to happen or does not make sense to work towards anymore for whatever reason. Pay attention to other teams’ OKRs and potential cross-team impacts. Since we started using OKRs to organize our agile teams, we’ve learned a lot about dos and don’ts. We see lots of value in using this process to create alignment, purpose, and autonomy for the teams, as well as picking up ambitious goals with a focus on the outcome. When used the wrong way in a product team, OKRs can add additional overhead without a tangible return. Many agile teams turn into feature factories and execute on backlog items. So don’t turn your backlogs to OKRs! Don’t pick too many OKRs: two or three objectives and three to five key results is about the right balance in our experience. And don’t make the process top-down; let the teams be part of the definition process. But do use the OKR system. OKRs help everyone align on the big objectives and the expected measurable outcomes. This allows teams to autonomously come up with creative approaches on how to get there. Similar to OKRs another performance management framework that is often discussed are key performance indicators (KPI). - Ali Pourshahid, PhD, is the Director of Software Developement at Klipfolio. He can be reached at @ali_pourshadid. - Qing Wei is a development manager at Klipfolio. He can be reached at Qing Wei @ LinkedIn. - Stephen Yates is a product manager at Klipfolio, he can be reached at @yates_stephen.